Like many beauty fans, I love my Beauty Blender. 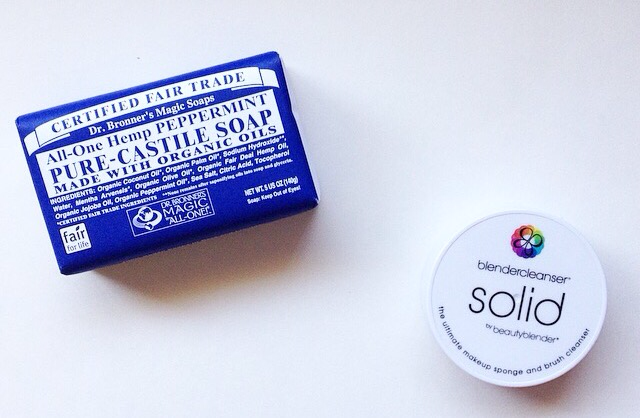 I also really like their solid bar cleanser. It cleans my Beauty Blender sponges with little effort, and it also does a great job getting cushion compact air puffs clean. Those cushion puffs get really gross looking, really fast, so I like to wash my puff(s) once a week. So, with all this frequent washing, I noticed that my tiny round Beauty Blender bar cleanser was getting smaller and smaller very quickly, so it was time to replace or buy something else. The bar is $16, which is pricey when you consider that it’s bar soap and it is quite small. This led me on a mission to find a less expensive dupe. I Googled and Pinterested and my searches kept bringing up recommendations for Dr. Bronner’s bar soap. I’ve seen the Dr. Bronner’s soaps in stores and online over the years, but never tried anything from the line. They support Fair Trade and use organic ingredients, but I think the packaging always turned me off. So.many.words on that label. If you’ve come across any of their products, you know exactly what I mean. I am guilty of TL:DR-ing right past them in the store. Anyway, it was less than $5 at Target, so I bought one in Peppermint. I’m happy to report that the Dr. Bronner’s soap got my air cushion puffs as clean as the Beauty Blender solid cleanser. I was really impressed and surprised! In my experience, many natural cleaning products don’t perform as well as traditional cleaning products. But, I was happy to be proven wrong by this. The Dr. Bronner’s also provides a satisfying level of foam, rinses clean and has a mild Peppermint scent, so it’s pleasant to use. I’ve heard that the liquid Dr. Bronner’s is also a dupe for the liquid Beauty Blender cleanser, so I’ll be checking that out, too. I love Dr. Bronners!! We use the liquid castile soap in the shower, as all purpose cleaner, fruit wash, dog wash and it is the best make up brush cleaner ever. I have about 6 scents plus unscented….huge value since they can be used for so many things, plus organic oils and fair trade makes it win-win! I’m looking forward to trying the liquid version and reading up on all the various uses. Thanks for the other suggestions!